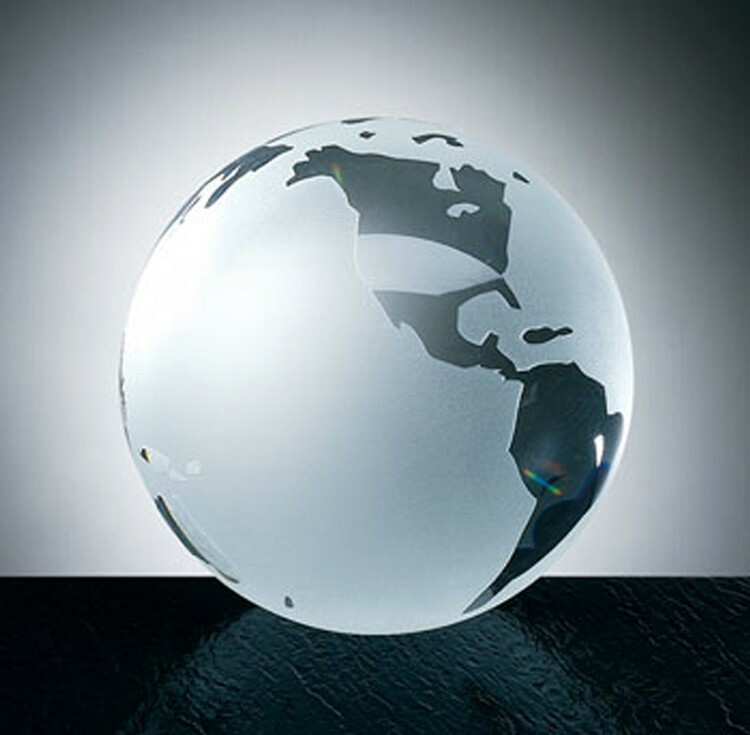 World Globe-Flat Bottom-Molded Glass-Oceans Etched. 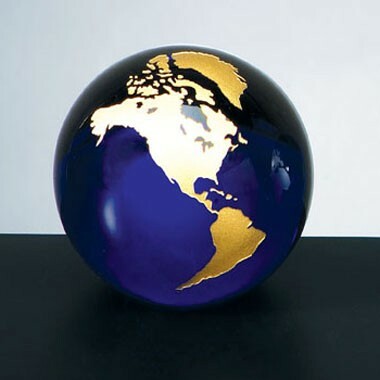 3" diameter cobalt blue molten glassworld globe, gold continental paperweight with flat bottom. 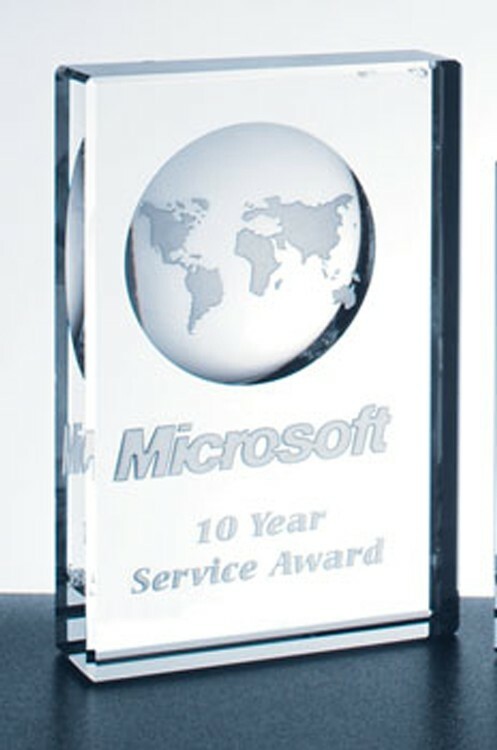 A new millenium. 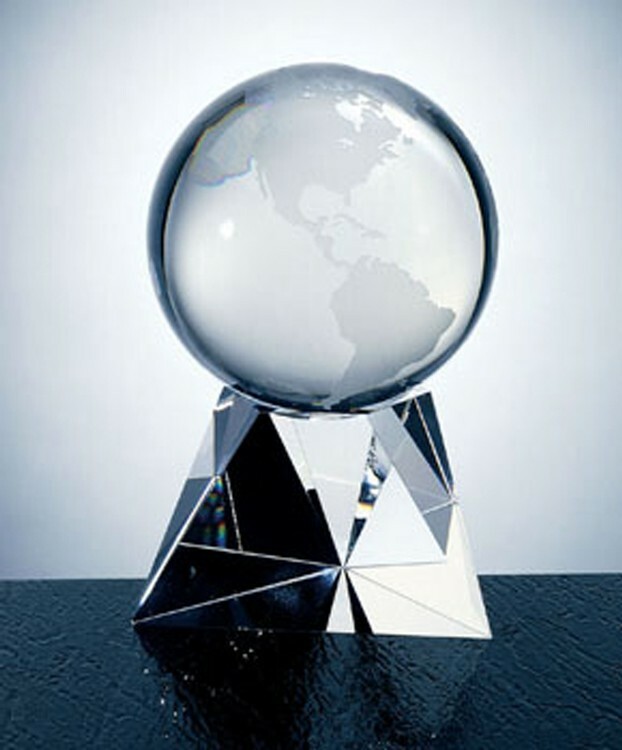 The dawn of a new era. 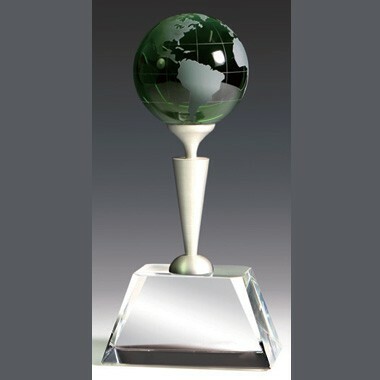 One of our most dramatic awards, "Millenium" features a round concave "dimple" carved in the back of the sculpture, with a globe image… the earth appears to be suspended in the crystal! 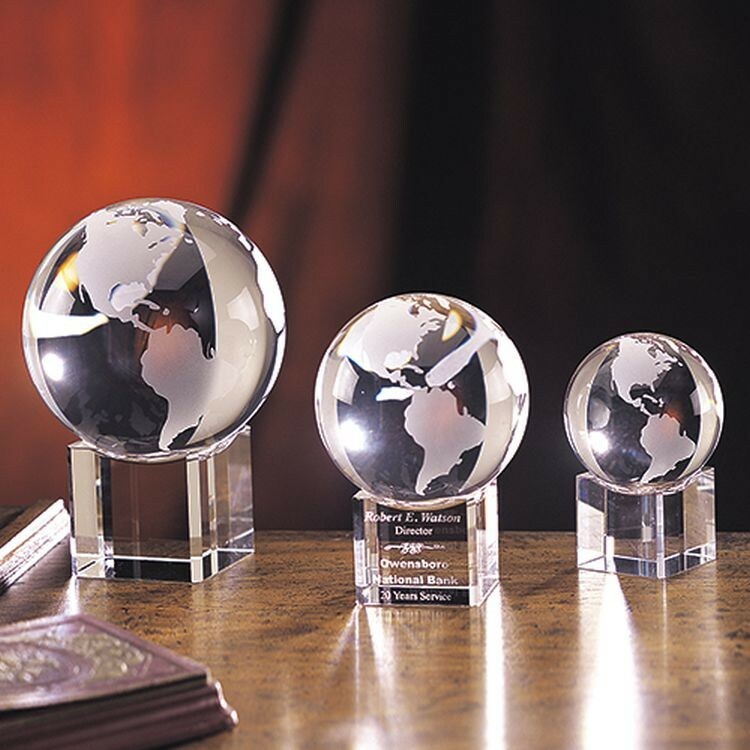 An ideal recognition or corporate gift for any globe traveling high achiever or someone who thinks globally, "Millenium" is certain to be appreciated. 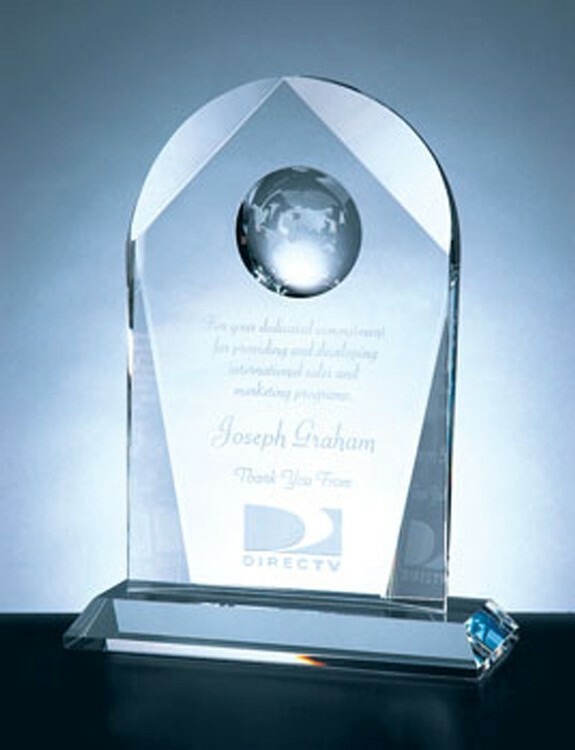 Shown with the arched top, this beautiful 6" sculpture is crafted from finely cut optical crystal and features a generous area for etching. 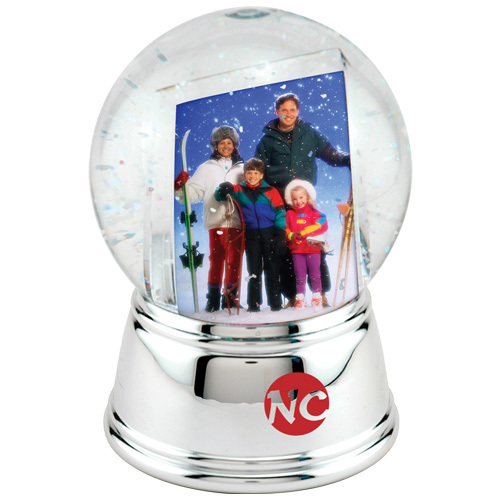 Also available with a Bermuda Blue coating behind the globe (SP137D-BB). 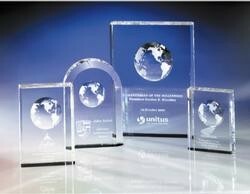 Recommended Bases: SP714, SP814. 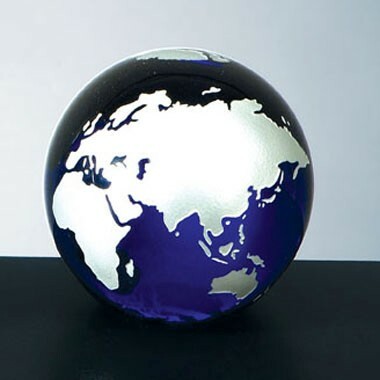 Exclusive to J.Charles, our Grande Planet will surely bring excitement to your upcoming event. 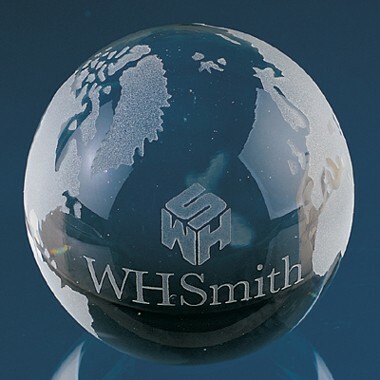 Mouth-blown and hand-cut, each globe is perched beautifully upon its well-proportioned base affording plenty of room for your inscription. 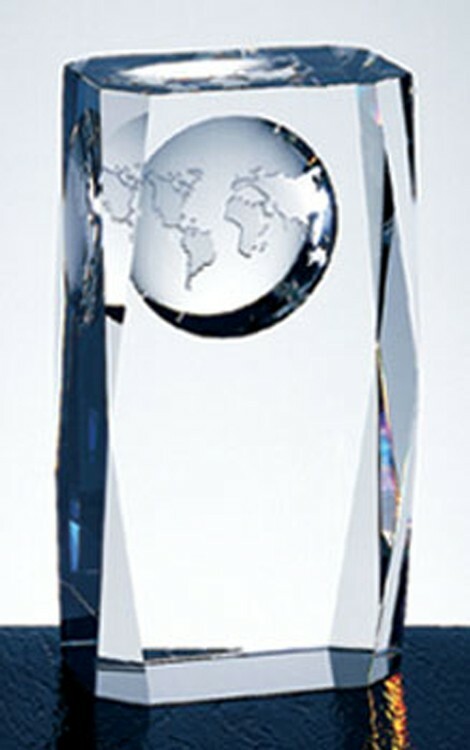 World Globe Tower Award-Optic Crystal. 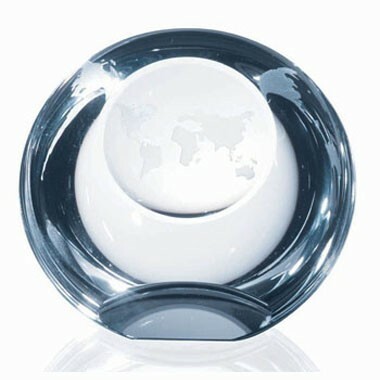 Swank Arch Globe Award-Optic Crystal. 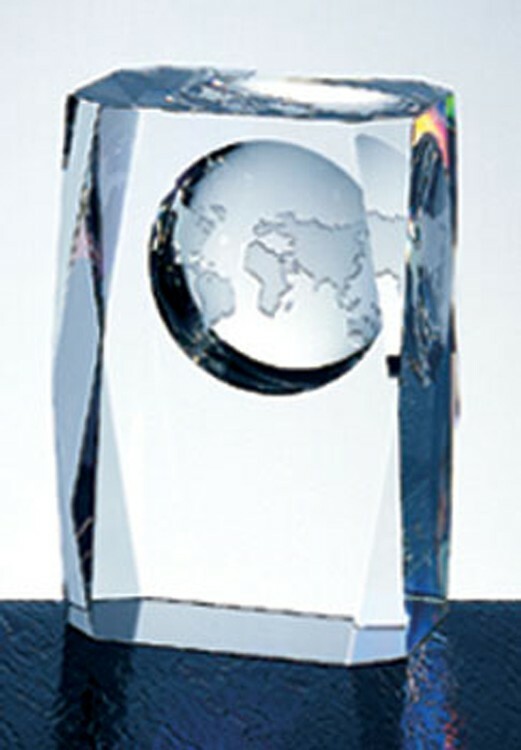 World Globe Peak Award-Optic Crystal. 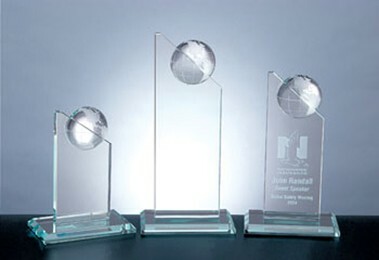 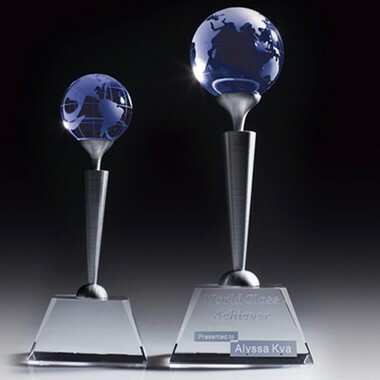 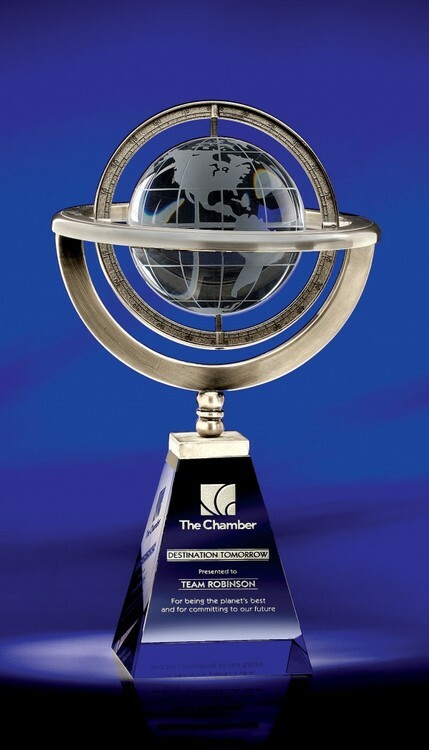 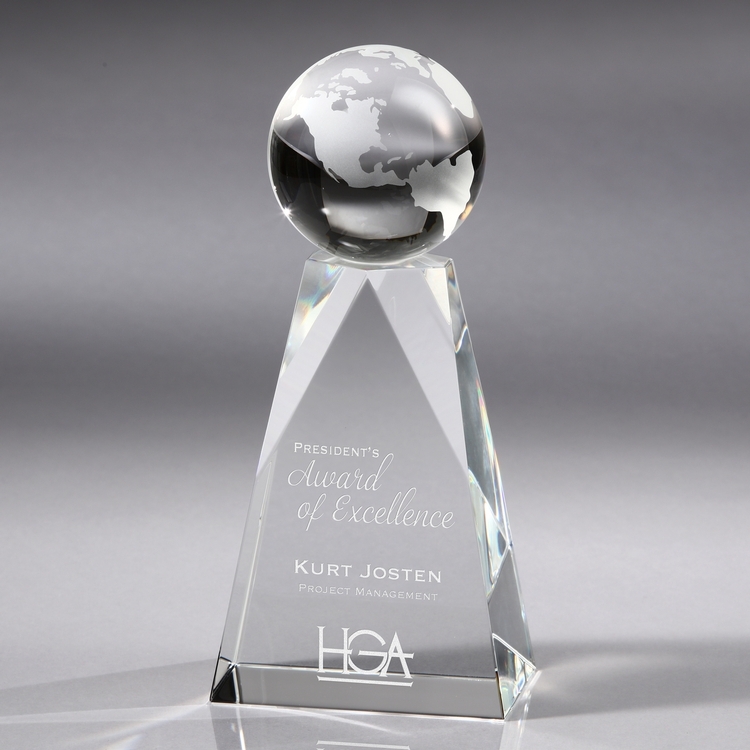 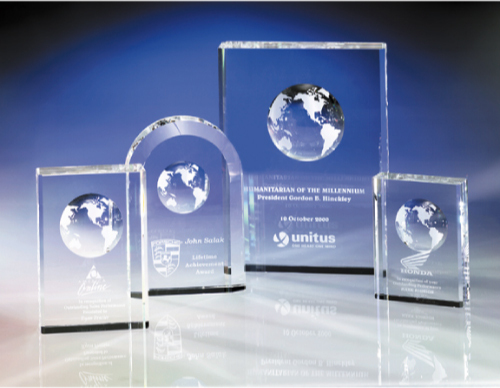 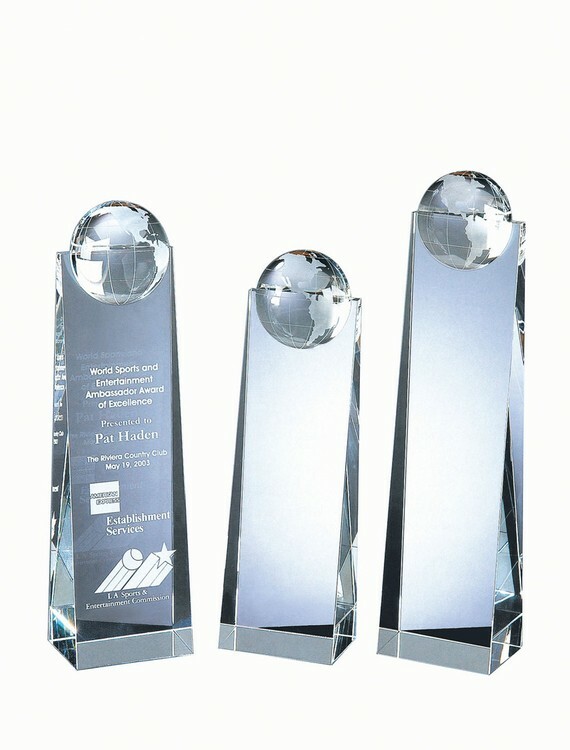 The optical crystal award features a globe design that sits on a square crystal base in a unique design that creates a "spinning globe" feeling. 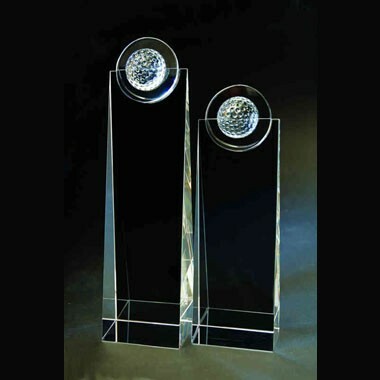 Description: Crystal Golf Tower Material: CRYSTAL Color Available: Transparent Measurement: 9" x 3" x 2-3/8" Imprint Area: 7" x 3"
Chic Globe Block Award-Optic Crystal. 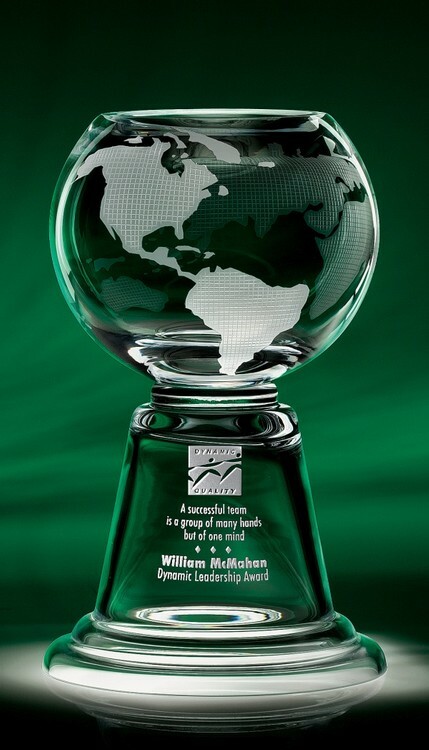 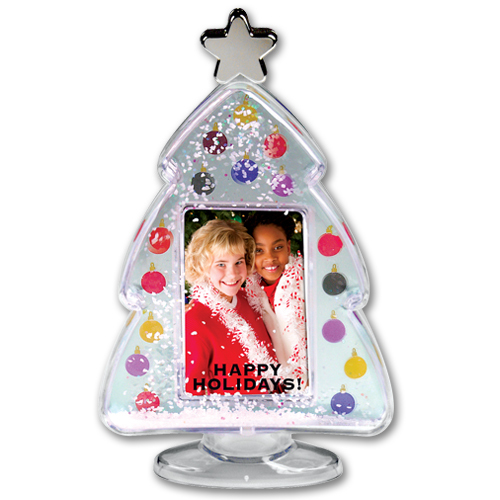 New style optical crystal award,green crystal globe perched on metal pole standing on clear crystal base. 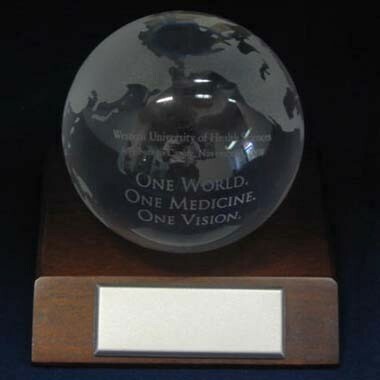 World Globe w/Triangle Base Award-Optic Crystal. 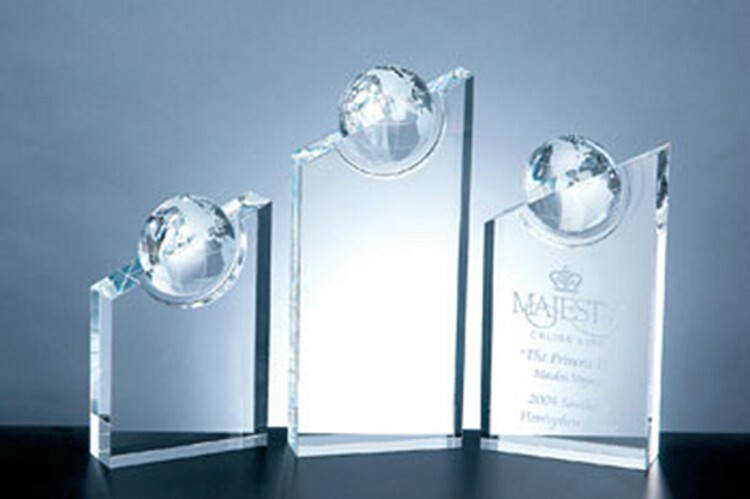 Our exclusive Omni Crystal Globe is so heavy it requires two hands for lifting. 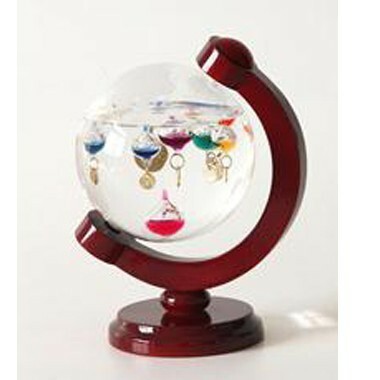 Featuring antique silver-plated metal and solid optic crystal, when it comes to detail it's no lightweight either. 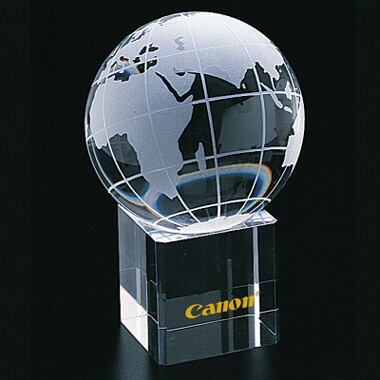 The etched globe rotates freely on its axis for an added touch. 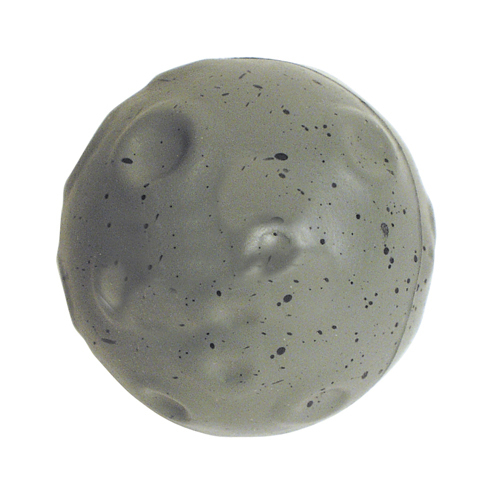 Note that for safety this item is packed as two separate pieces and requires minimal assembly.